If your phone doesn’t have got magnetometer (compass) sensor most of app features will not work, f.e. compass will not work. If your phone doesn’t have GPS – there can be problems with finding your location (f.e. on tablets without 3G/4G connectivity when there is no wifi connection). If your phone doesn’t have rear camera – ARview will not work. This app was made to make satellite dish alignment easier. Basing on given GPS (or entered) location and selected satellite (or even TV provider) app will calculate proper azimuth and elevation angles. The built in compass will show you where you should point your dish. The result can be also shown on map. First of all, you should enable GPS and Internet on your phone. Remember – in most cases it is impossible to receive GPS signal inside buildings. 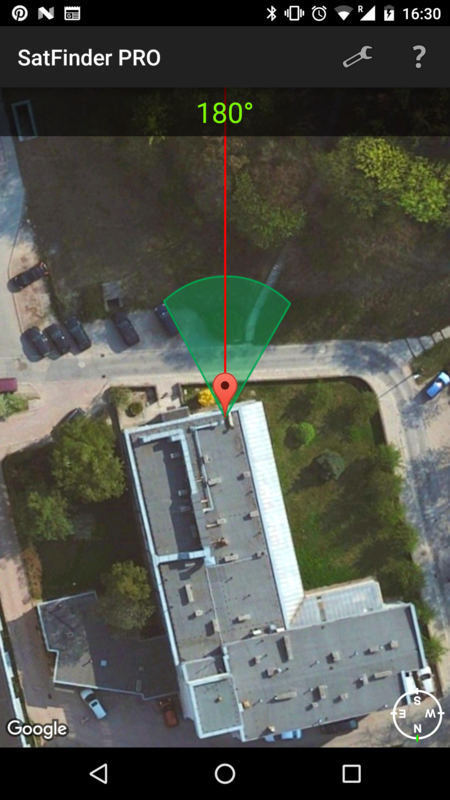 So if you want to get very accurate location – please go near windows or go even outside.In current app version location should be found quite immediately. So if you stuck with ‘no location’ message please make ensure that you got enabled all required features. If app found your location, you must select desired satellite. To do this you must find icon with magnification glass and tap it. On the list you will find all satellites with elevation angle above zero degrees. Remember: satellite name doesn’t affect the calculation of angles. Important thing is satellite position. The azimuth, elevation and skew angle is calculated for your location and chosen satellite. Under calculated values there is a compass with graphical representation of azimuth angle. The azimuth angle is calculated with magnetic inclination. Remember – every time you use compass – you should calibrate your compass. I do this like that: https://www.youtube.com/watch?v=sP3d00Hr14o . 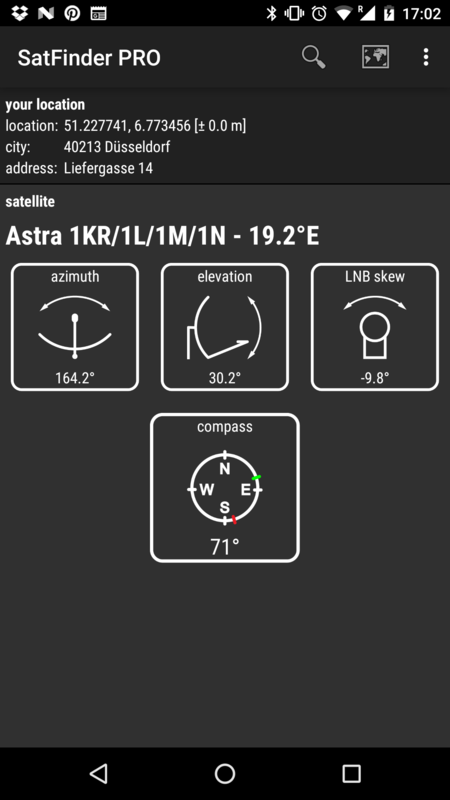 On compass indicator red line represent calculated satellite azimuth. Green line represents your phone azimuth. So if on compass green and red indicators are on each other – front of the phone should show you direction to the satellite. 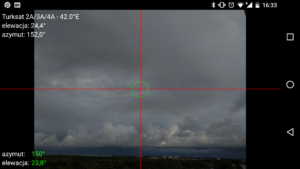 If the compass value is correct – phone azimuth value will go green. 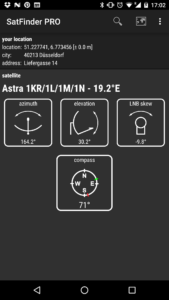 In ARview mode satellite data from compass and accelerometer are casted to Camera view. So there is a possibility to visualize where exactly the satellite is on the sky. In this mode user can check what satellite dish see (It should see clear sky. So if you see f.e. trees – you should consider another place to mount the dish…). If for some reasons you want to check angles for different place than you’re – you can use geocoder mode. In this mode you enter localization name. What type to get proper localization? I type always localization like “city, street”. 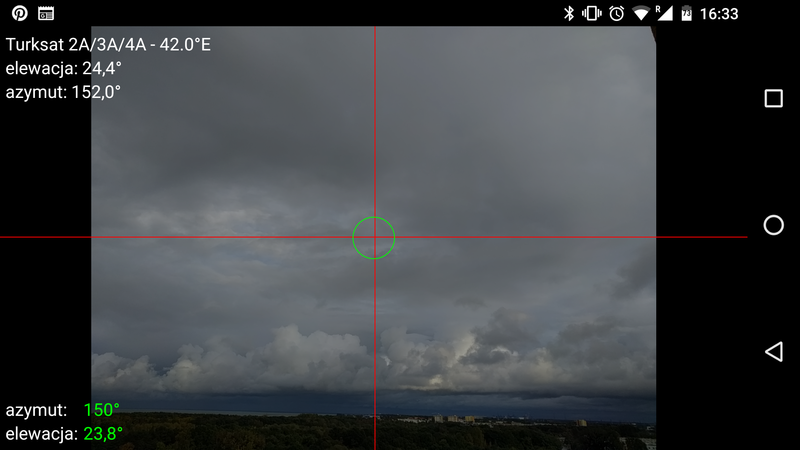 In app settings there is possibility to set compass offset (if needed) and Compass low pass filter. Low pass filter is smoothing compass data. As I said the satellite list is quite long. If you are using every day only a few satellite positions you can create custom satellite list. The list file should be named as satfinder.csv and putted in root directory od SD card. The file should be encoded in UTF-8. Here is the original list from SatFinder. Feel free to change it in your way If in file there will be errors – some position may be not shown. If you have any further questions please send me e-mail. If on your device something is not working or you found error – also send me e-mail. For me it is important to have happy users. If you like my app and use it ofter you can donate me by buying pro version on market.